When I make jack-o'-lanterns, I usually go for funny or happy faces rather than scary ones. I'm just not into horror, I guess! Actually, the best part of jack-o'-lanterns for me is roasting and eating the seeds afterwards! 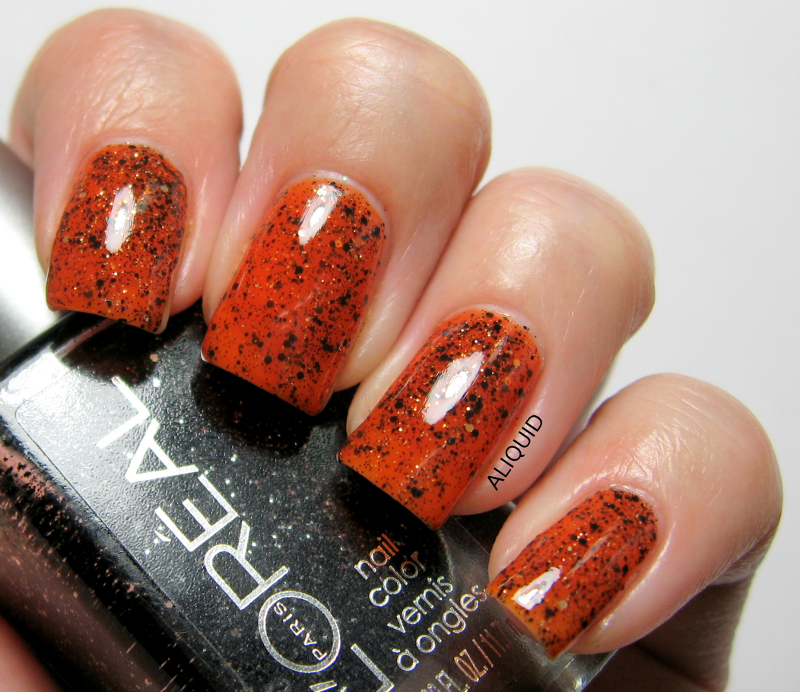 For this mani I used Revlon Stiletto, Orange Pop and Posh, plus Sally Hansen Lightening. This is the first decent-looking jelly sandwich mani I've done! I used two coats L'Oreal The Bigger the Better (black and silver glitter) in between three coats of Zoya Coraline. Halloween orange is pretty much the only shade of orange that looks good on me! Congratulations! 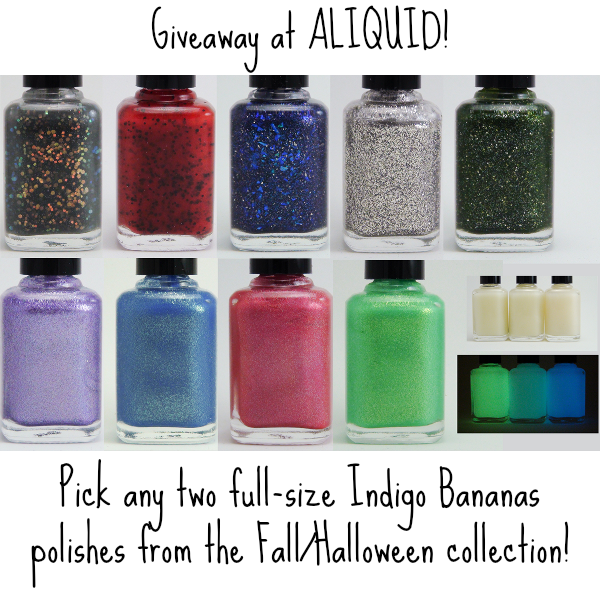 You have 48 hours to let me know which polishes you'd like! Thanks to everyone else who entered, followed and liked--it's great to have you here! Like I said, it's very simple (and quick too): chop up two medium onions and a few cloves of garlic. Cook the onions in a little bit of neutral oil (I used grapeseed) until they're soft, then add the garlic and a tablespoon of chili powder and cook a minute longer. Add 3 cups (about 2 cans) of cooked black beans, 4 cups of any kind of stock, and salt and pepper (also, if you're not a wuss like me, you can put in a chile pepper). Bring everything to a boil, then simmer for about 10 minutes. If you like, you can puree some or all of the soup to thicken it up--I used my immersion blender but didn't puree the soup completely, so there were still some chunks of bean and onion in there. Add 2 teaspoons of lime juice and you're done! We ate it with cheese, sour cream and cilantro. 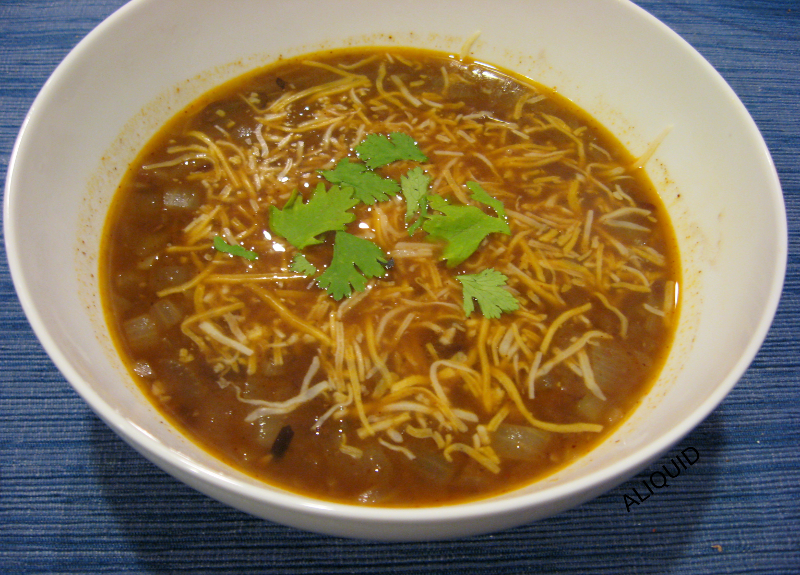 This soup is very hearty (especially if you add sour cream) and flavorful, with just a little bit of spiciness. Plus it satisfies my neverending craving for Mexican food. I'll definitely be making this one a lot over the winter! 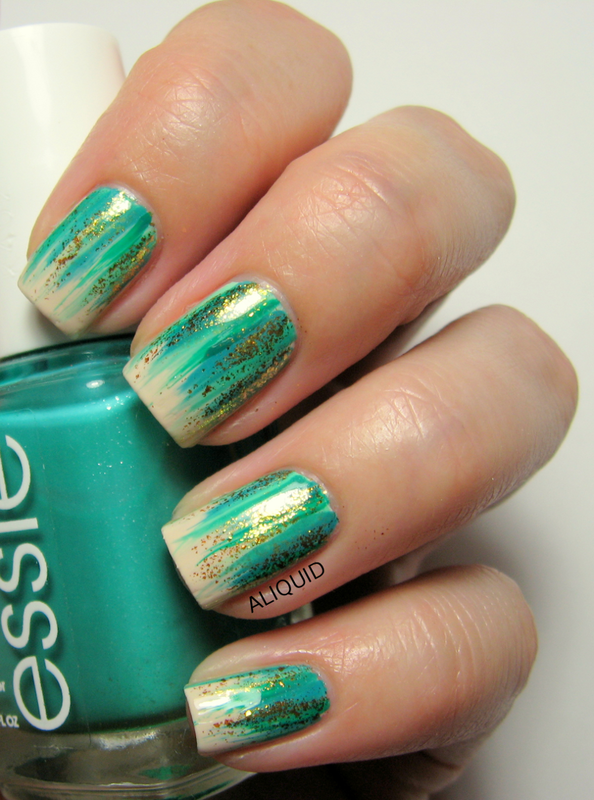 Here's a few pics of my current nails; I'm wearing L'Oreal The Muse's Attitude, which I also picked up at Rite Aid last week. 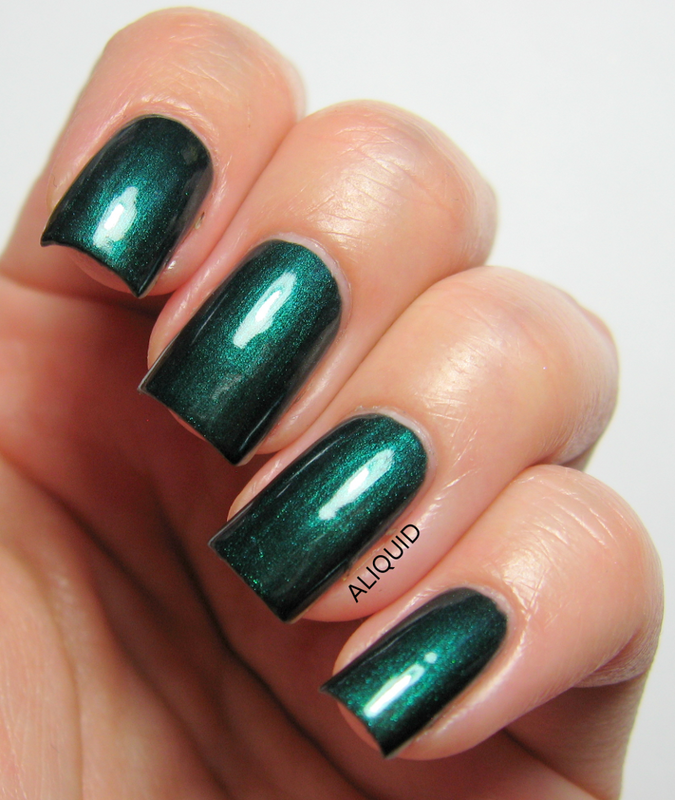 It has a blackened base with a pretty green-to-teal shifting shimmer. L'Oreal The Muse's Attitude. Two coats with Out the Door topcoat. Pretty, no? 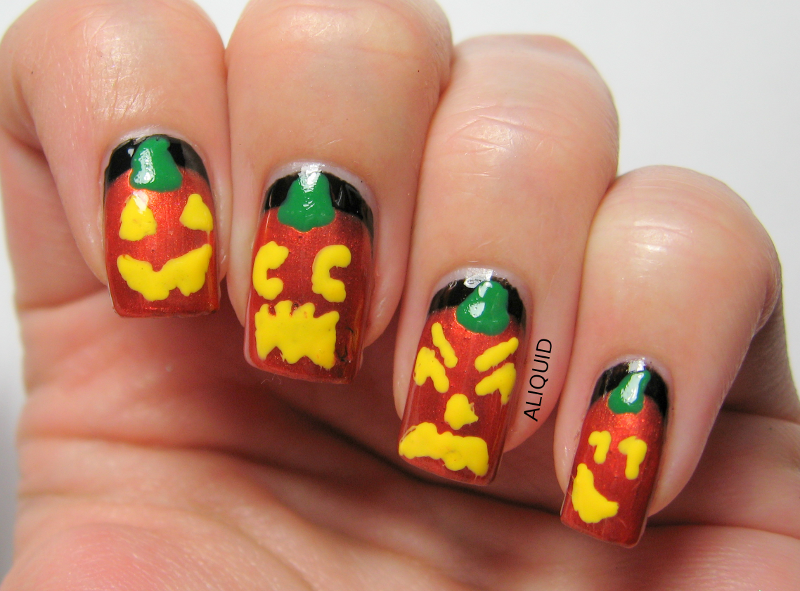 This could be a nice Halloween polish if you're dressing as a witch maybe! I actually couldn't capture the full spectrum of the color shift--in normal indoor light this polish looks fully green with no blue undertones. I had no problems with application. I grabbed The Muse's Attitude for $5.99 (11.7 ml) at Rite Aid! Wintermint is a seafoam green foil with tiny blue hexes, lots of gold shimmer, and I think I spotted some copper sparks in there as well. 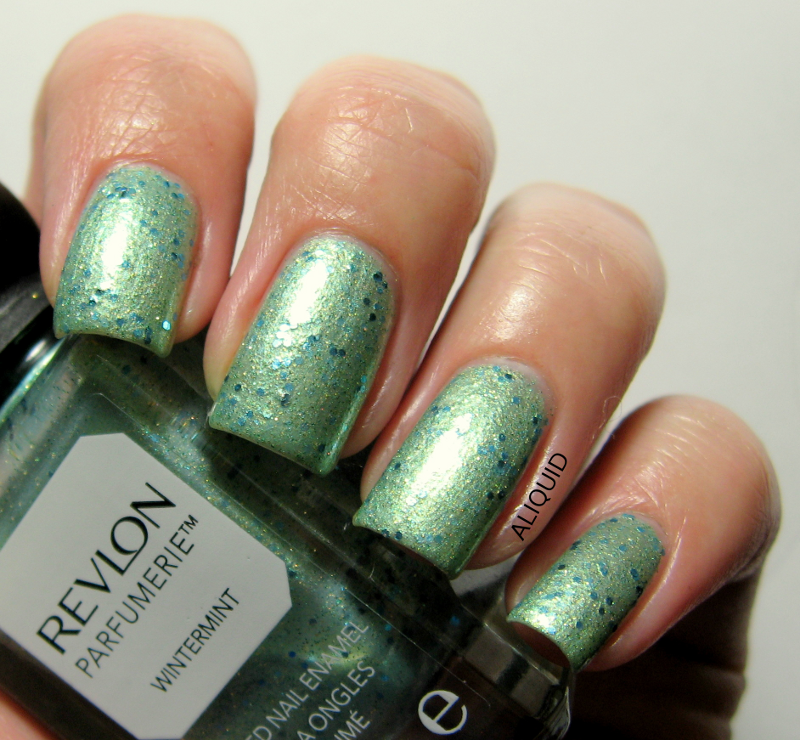 Revlon Wintermint, two coats with Out the Door topcoat. 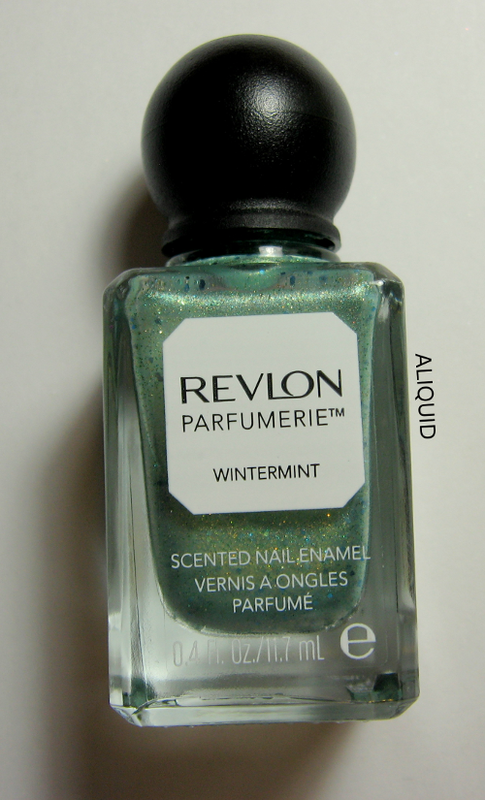 You might have noticed that Wintermint is very similar to the popular (and expensive) Deborah Lippmann Mermaid's Dream. I don't own Mermaid's Dream, so I can't compare them directly, but judging from pictures they are pretty close--Mermaid's Dream looks to be a touch more blue, and seems to have a bit more glitter. Wintermint also looks less bumpy than Mermaid's Dream. I can't call them dupes, but I certainly don't feel the need to own both! Wintermint applied very nicely, and the glitter distributed itself evenly. Despite being a foil, it was easy to get nice thin, even coats. The texture is pretty smooth with topcoat. As for the scent, it smells like spearmint gum! The scent isn't strong (at least not under topcoat)--I generally have to get my hand pretty close to my face to smell it. I think Revlon did a nice job with this polish. I'd like to go back and look at some more from this collection; I'm a sucker for smelly things! I bought Wintermint for $5.99 (11.7 ml) at Rite Aid. Good evening everyone! I'm still fighting this cold (it's moved from my throat to my nose, ick) but I gathered the energy to do my nails today. I didn't have a very strong vision for how I wanted this to look; I just played around with doing little splotches of different colors in a vaguely gradient-like fashion (yellow-green in the middle and blue-green and black towards the edges). Since I didn't know what to call this mani, I asked for help from my friends in the nail thread at Something Awful. Kirby at The Mercurial Magpie suggested "Rainbow Camo", while Andrea of Indigo Bananas preferred "Parrot in a Blender" (vivid imagery!). I also got the suggestions "Jumble in the Jungle" and "La Grande Jatte" after this pointillist painting. What do you think? Does it remind you of anything? Happy Friday! I have a cold right now. :-( But I still had the energy to do my nails today! 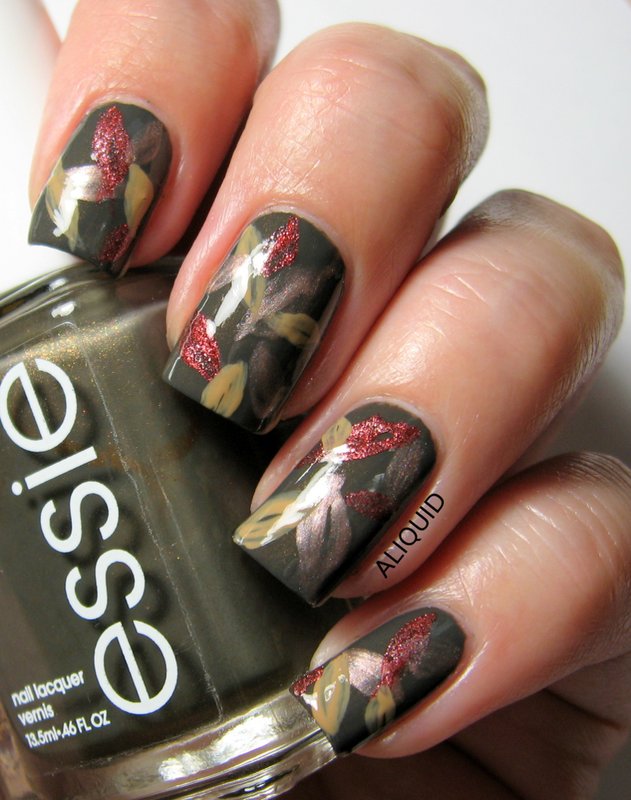 I felt like having a fall-themed mani, since the leaves have really started to turn here. I also wanted to practice some freehanding. The base color is Essie Armed and Ready (which has a nice gold shimmer in the bottle that's hardly visible on the nail). 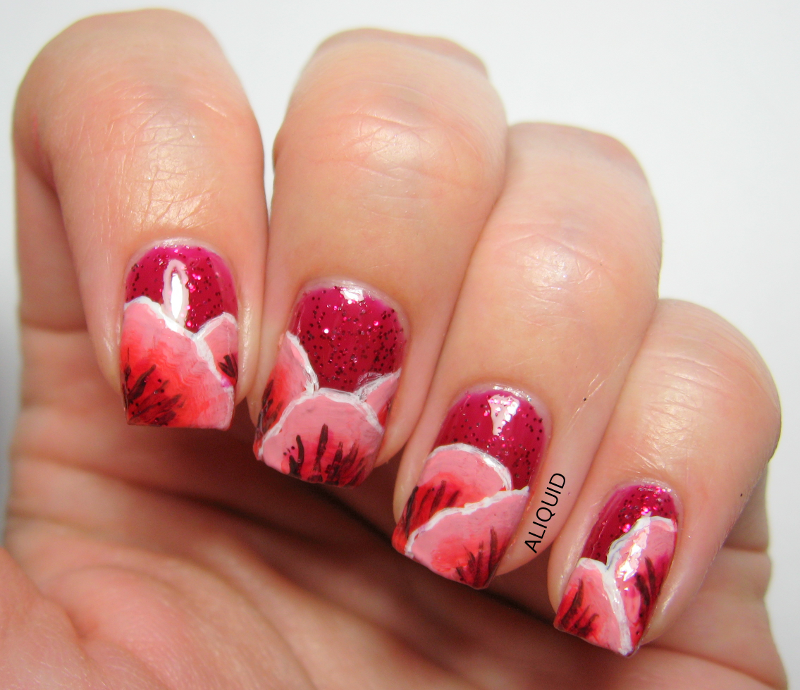 I painted on the leaves with Orly Sand Castle, Julep Minka and Julep Otte. Is anyone else excited about fall? My favorite part of it is being able to get hot apple cider everywhere! Good morning! 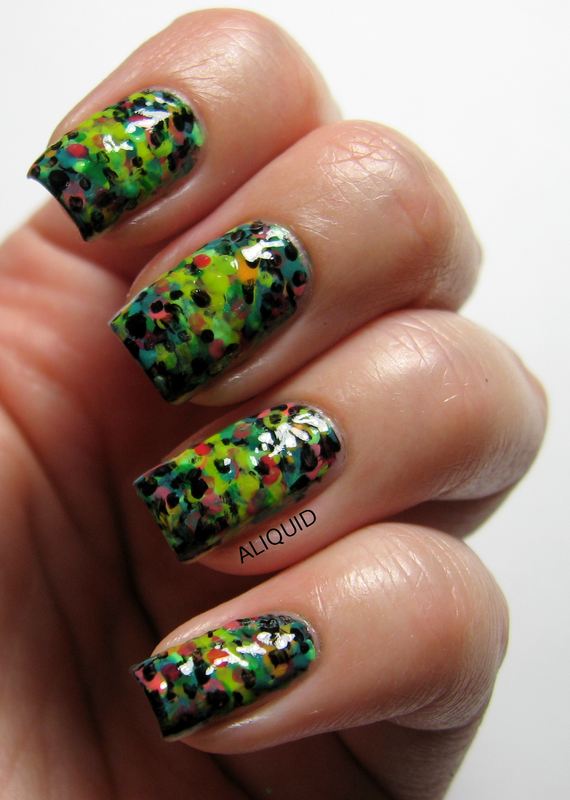 Today I wanted to show you another set of nail wraps from Incoco's Fright Night collection. (Here's my other review from last week.) 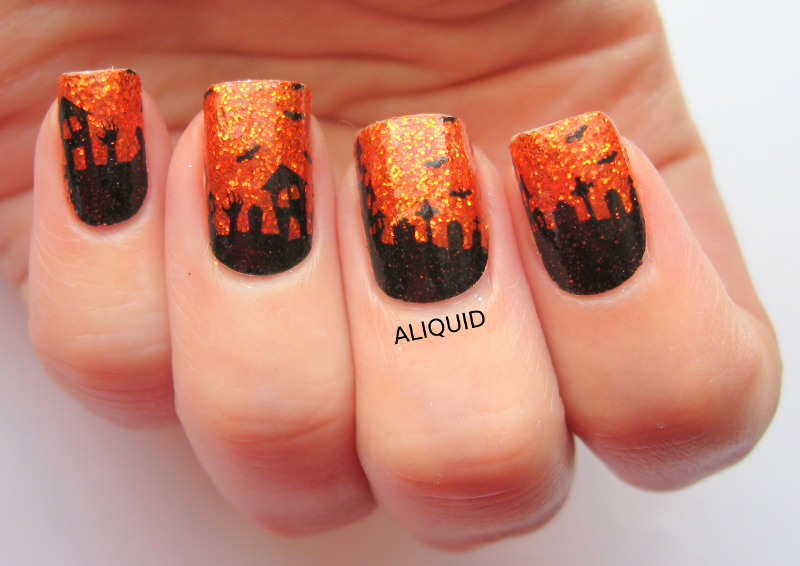 This pattern is also called Fright Night, and it features a haunted house and graveyard pattern over orange glitter! 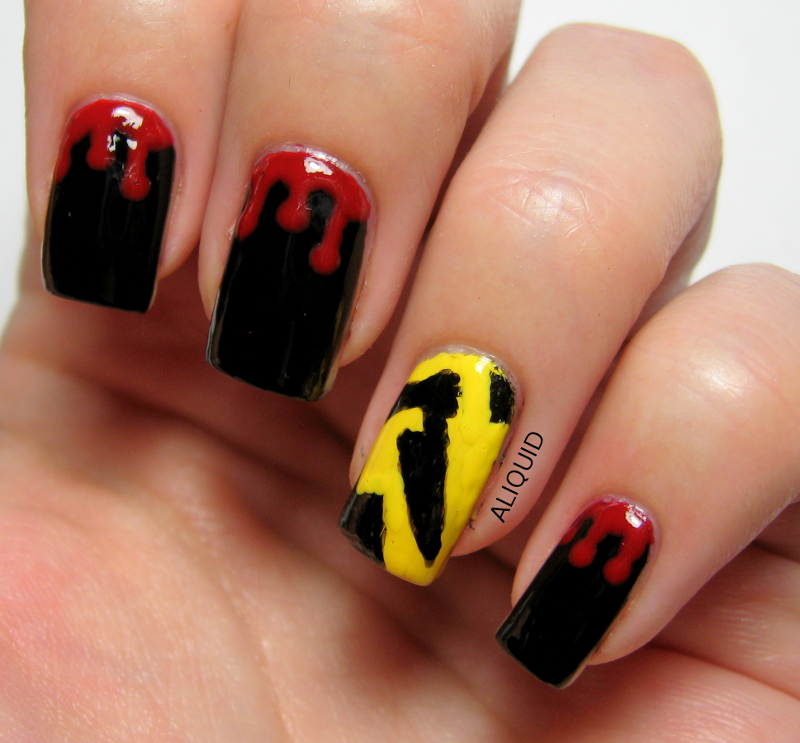 Incoco Fright Night nail polish appliques, no topcoat. As usual, these appliques were very easy to apply smoothly and remove, since they're made of nail polish and are quite stretchy--none of them tore while I was stretching them either. 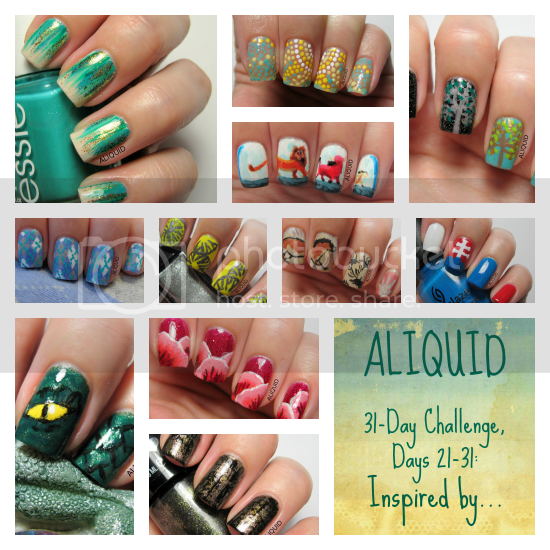 Definitely recommended if you're looking for an easy but intricate Halloween mani! You can buy Fright Night at incoco.com ($8.99 for 16 double-ended strips). You can also follow Incoco on Facebook, Twitter, Pinterest and Instagram! Is anyone getting excited for Halloween yet? This is the first year we might get trick-or-treaters coming to our door, and I can't wait! 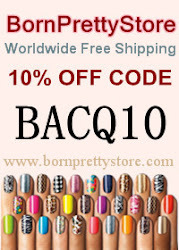 Incoco Bone Rattling nail polish appliques. No topcoat. Like previous Incoco nail polish appliques I've tried, the Bone Rattling wraps applied nicely with no wrinkles thanks to their stretchiness. It might be my imagination, but I think these were a little more resistant to tearing than the earlier ones--maybe they've tweaked the formula? 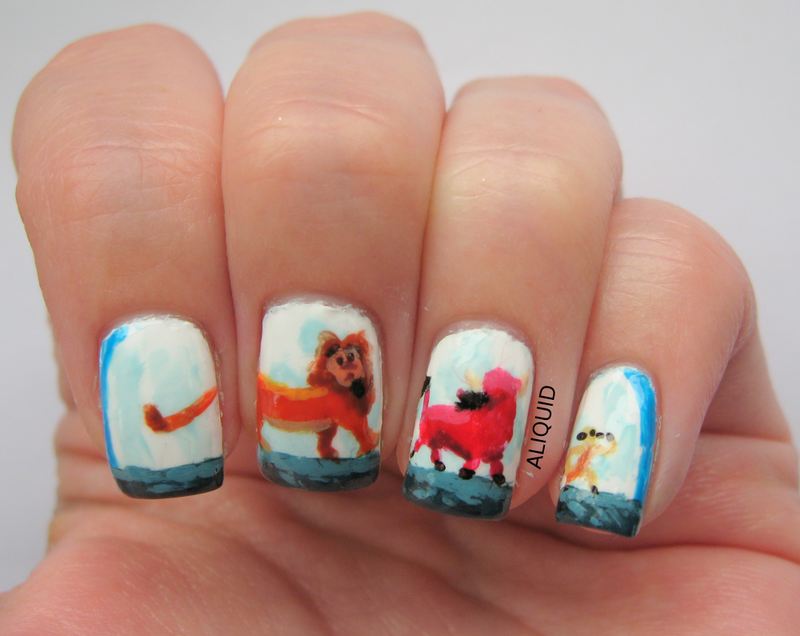 The one issue I had was that occasionally the strips didn't want to stick on the corners of my nails. For that reason I added topcoat after I photographed my nails, even though you're not supposed to need topcoat with these. Oh, and did I mention they glow in the dark?? Spooooky! You do have to charge these immediately beforehand, or the glow will be weaker. I had my nails under a bright light while swatching, and then took this pic, but twenty minutes later (after sitting in normal indoor light) I went back into a dark room and they weren't glowing as much. Bone Rattling appliques are available (along with five other Halloween patterns) at Incoco.com for $9.99. You can also follow Incoco on Facebook, Twitter, Pinterest and Instagram!